Explore the Projects tab of your online account and learn how to create and manage your prototyping projects. When you log in to your Justinmind online account, the first tab you’ll see is the Projects tab. The Projects tab displays a list of your projects, each containing one or more shared prototypes. 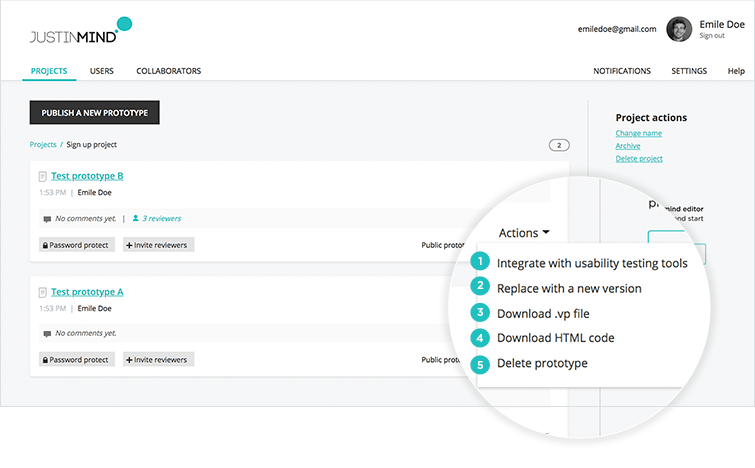 Click the “Publish a new prototype” button to share one of your prototypes to your online account. 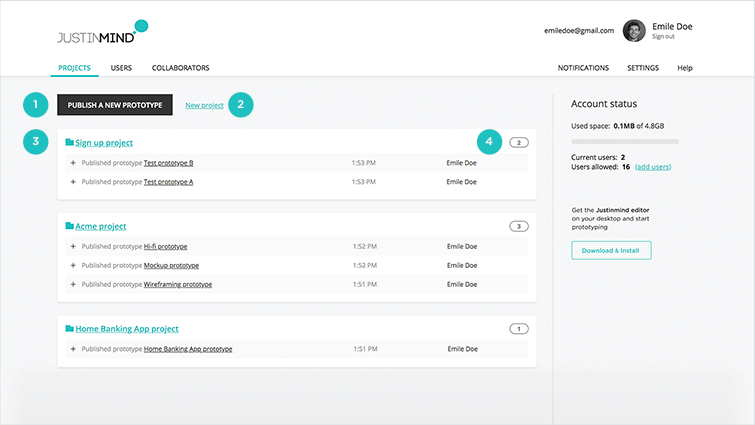 In the dialog that appears, you can select the prototype you want to upload from your folders, as well as the project you want to place it in. Click the “New project” link to create a new project. A project’s name can be up to 100 characters long and can contain any Unicode character. Your projects are listed under the “Publish a new prototype” button. Below the project’s name, you’ll see a list of shared prototypes contained within the project. 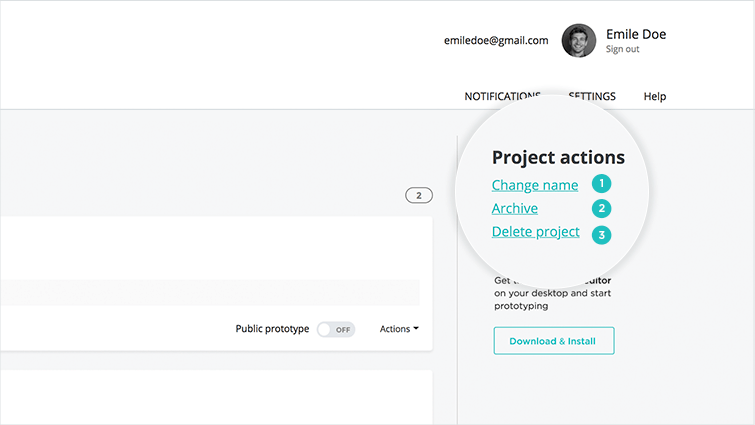 On the right, a circled number lets you know how many shared prototypes are contained within each of your projects. To see the contents of a project, click on the link next to the folder icon. A description of a prototype within your project, including name, date and owner. Click on a prototype’s name to simulate it in a separate window. 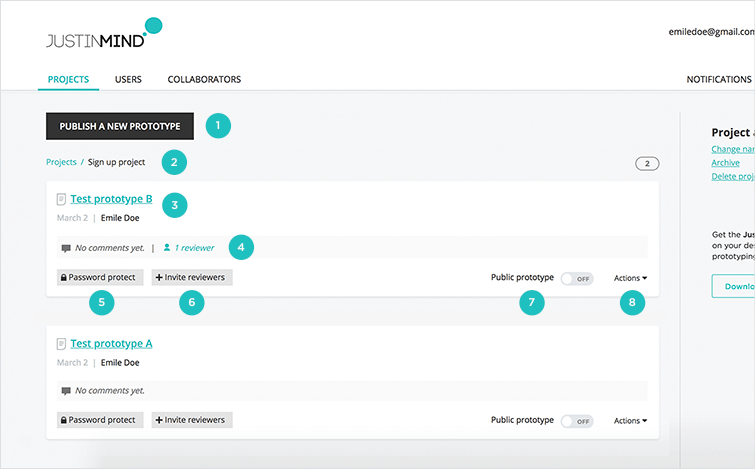 Reviewers will access your prototype via a public or private link. To make your prototype password protected, click the “Password protect” button. Click the “+ Invite reviewers” button to invite reviewers to review your prototype. Learn more here. Slide the “Public/private” toggle on to allow public access to your prototype. On the right of the toggle, a “Get link” link will appear. Anyone you share this link with will be able to view and interact with your prototype. If your prototype is password protected (5), you will also need to provide them with the passwords. 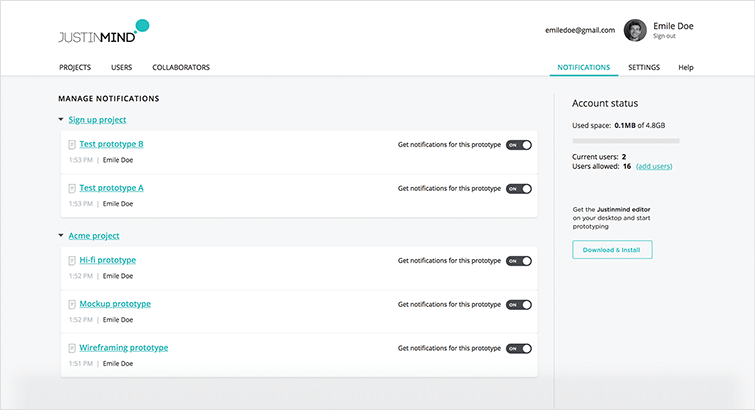 Slide the toggle off if you want to limit access to those you have invited to review your prototype. 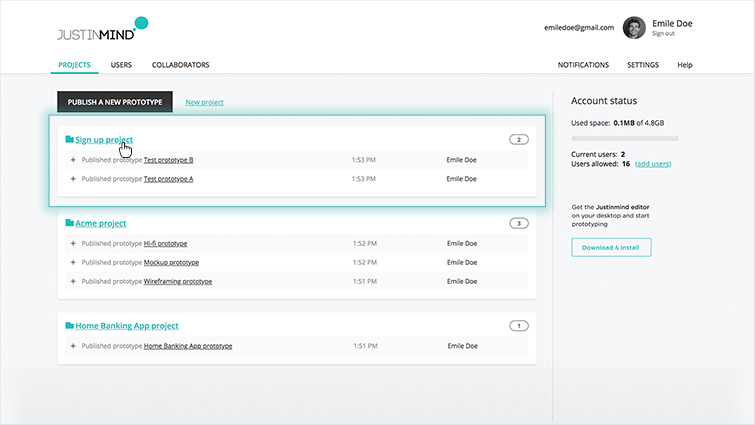 Integrate with usability testing tools – click to perform user testing with your prototype. 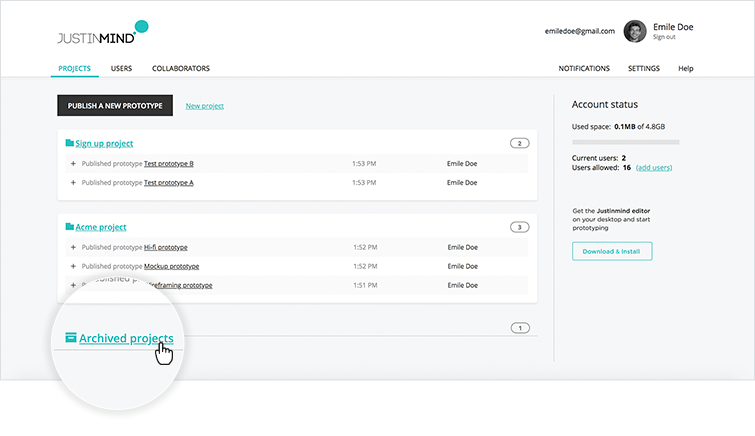 A dialog will appear, allowing you to select a testing tool to get started with. Archive – click to archive the project. The project will be stored in the “Archived projects” folder below. Its prototypes won’t be accessible, but will still contribute to the amount of space used in your online account. Delete project – click to delete a project. Note that this action requires confirmation and is irreversible. Click on the “Archived projects” link to view its contents. Delete it permanently. Note that this action requires confirmation and is irreversible. As owner of a prototype, you will receive notifications via email every time a reviewer makes a comment on your prototype.